Once again, the wind of change is blowing across the land of Nigeria as sack letters are being issued to top government officials. During the weekend, there were new vice chancellors for some universities which included Northern politician and activist, Najatu Muhammad. It would have been a wonderful opportunity but the recipient has chosen to reject the nomination in somewhat a controversial manner using paper media. 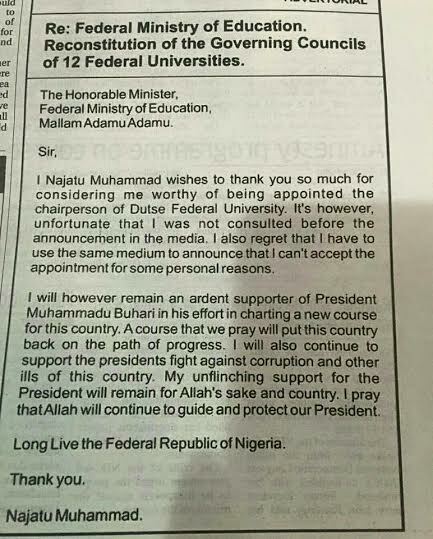 The publication was made in the quarter page of Daily Trust newspaper publication today, to announce her rejection of an appointment by President Buhari. In her publication, Najatu revealed she was rejecting her appointment to serve as Chairperson of Federal University Dutse for personal reasons and explained the use of newspaper to reject the appointment saying that it was how she got to know of her appointment. Do you now have an idea what personal reasons she was talking about?